This is the bicycle touring equipment I am taking with me for a one month bike tour in Greece. I've used the vast majority of gear on this cycle touring kit list many times before, so it's a tried and proven bike touring setup. Before I leap straight in on the touring gear I'm taking with me, a quick foreword. No two people are the same. No two bike tours are the same. This means that there are enormous variations when it comes to bike touring gear lists. Isn't that great?! We can all enjoy bike touring in our own way, taking along with us whatever makes us happy. There's no right or wrong way of doing it. 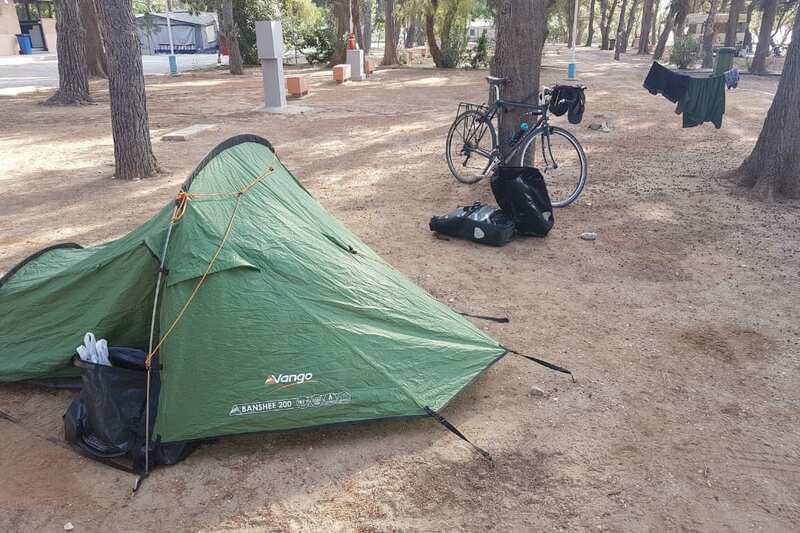 I'm sharing this cycle touring kit list, because maybe somewhere in all the touring gear I am taking, there is that one item that might make your next bike tour easier. Maybe it will help validate a decision you were going to make about buying an item of gear. Perhaps alternatively, you might look at the bike touring gear list and think I've got it all wrong! It's all cool – Take a look through, and leave constructive comments that can help others in the bike touring community at the end of the post. The ‘where' and ‘when' factors play a large part when it comes to choosing which bicycle touring equipment to bring along. My ‘where' is central Greece, more specifically the Thessaly and Epirus regions. My ‘when' is the month of September. You can read more here about the bike tour in central Greece. The terrain in the areas I want to bike tour through is going to be fairly mountainous, so I can expect plenty of steep uphill sections (and hopefully some wonderful downhill sections to match!). My accommodation choices on this bicycle tour are plentiful. There will be a few wild camping opportunities, some ‘official' campsites, and towns with affordable rooms. I'll do a mix of everything. Weather wise, I can expect temperatures ranging from 35 °C down to 10 °C. Rain is a distinct possibility in the mountainous areas near Metsovo. Conclusion: I'll need camping gear, wet weather gear, but prefer to keep my loaded touring bike reasonably light. As such, I've decided not to include a camp stove, fuel, pots, and dried food in my bicycle touring packing list. Yes, you heard right! This is not the first time I've bike toured without them. I got along without them just fine on my Hercules Bike Tour of the Peloponnese earlier this year. Not to mention half the journey when cycling from England to South Africa as well. On reflection, I don't think carrying the extra weight of cooking gear is justified on this particular bike tour. Especially when Greek food is so damn tasty and affordable! 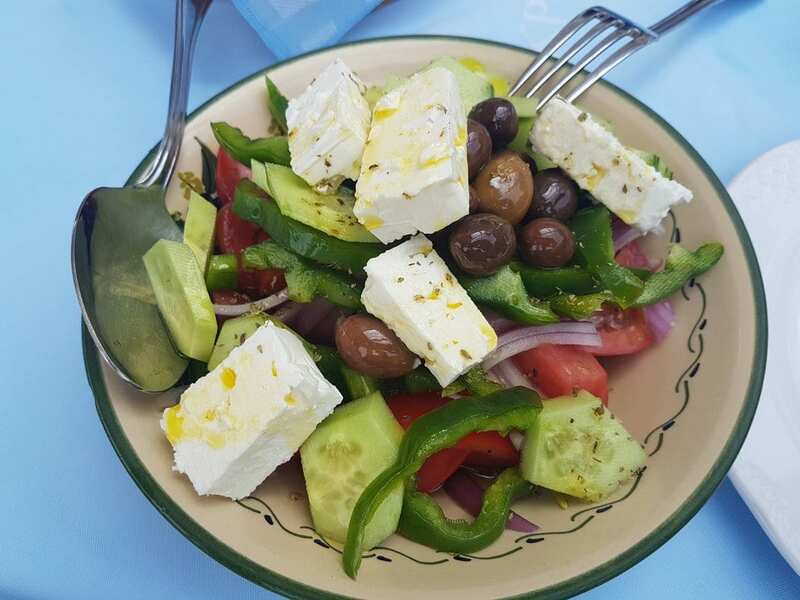 Instead, I'll buy fresh fruit and veg day by day, and eat one (or two if I'm greedy) taverna meals a day. On wild camping days, I'll just make sure to have food with me that can be prepared and eaten cold. I'll be using the Stanforth Skyelander on this bike tour, which is a classic steel touring bike. The 700c wheels will help me cover ground nicely over what I expect to be predominantly sealed roads. 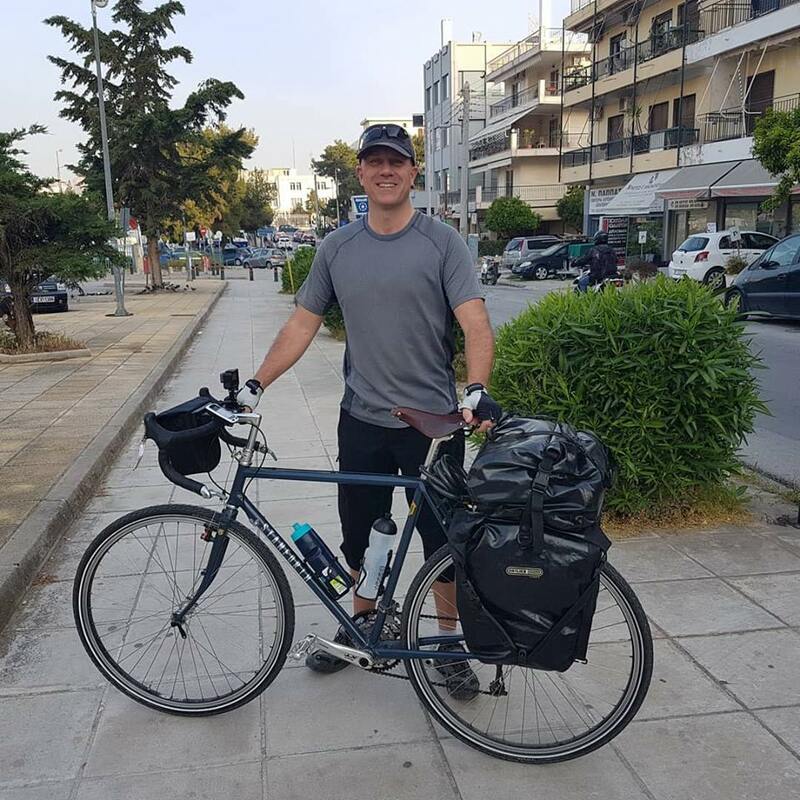 I've used the Skyelander on a couple of other bike tours in Greece, and it's as solid as they come. Maintenance for the 18 months I've had it has amounted to little more than oil on the chain, air in the tyres, and tightening the brakes. As I am confident in the bike, I'll be carrying a pretty minimal supply of spares (an inner tube, some allen keys, and puncture repair kit). If anything does go wrong, I'm never too far away from a town or city with a bike shop. Oh – There's no fenders. I'm not a fan of fenders for bike touring after several incidents when cycling from Alaska to Argentina when mud clogged between wheel and fender, stopping the wheel moving. The fenders also had a tendency to get bent and rub down on the wheel acting as a brake. I know some people wouldn't dream of bike touring without fenders. As I said earlier, it's each to their own. I only mention it so you know the reasons behind why I don't personally tour with them. Although the above picture was taken just before the Hercules Bike Tour, the setup will be the same. I'll be using a handlebar bag, two rear panniers, and a rackpack to carry the cycle touring equipment. This admittedly means that the bike is a little back heavy. Not terribly back heavy, it's just that the bike doesn't feel perfectly balanced. The front wheel can feel a little light at times, but it doesn't take a lot of getting used to. Well, to begin with, all the cycle touring kit fits into the bags shown. This means that in order to ‘balance out' the bike, I would need to attach a front rack, and take two front panniers. This would add 2-3 kgs of extra weight on the bike. I'm not a weight-weenie, but thought that this was a bit pointless. What are the positives of not having a front rack and panniers? – Less weight. Removes the temptation to take even more bike touring gear with me. What are the negatives of not having a front rack and panniers? – Less balanced bike. Slightly increased risk of rear rack failure or spoke breaking. I assume that most people arrive to the same conclusions when it comes to packing bags for bike touring. Bags should be reasonably balanced, with the panniers feeling that they weigh roughly the same. Gear that is most likely to get used when actually cycling at the top. Gear that can get damp or wet kept away from gear you want to keep dry. I've divided the bicycle touring packing list itself into different sections, such as bike camping gear, clothes, tech gear, wet weather gear etc. All the gear listed below packs onto the bike as shown above. If I've written a review of an item of gear, I've linked to it. There's also a video of my cycle touring gear at the end of the post, where I go into more detail. This is the camping gear I will take with me when cycling in Greece for a month in September. Most of this packs into the rackpack which sits on top of the rear panniers. I would say that my wet weather bike touring gear is still a system in development. 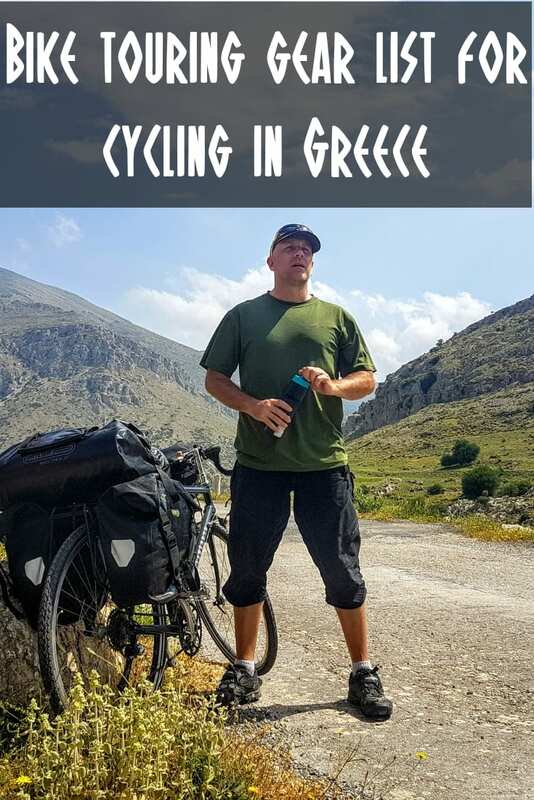 The main issue I've had in not developing it further, is that I tend to avoid bike touring in the rain in Greece if I can help it! That said, I'm pretty happy with the gear. As long as there is somewhere dry at the end of a day's ride, I'm normally good to go again by the following morning.I keep the wet weather cycling kit in my rackpack so it's easy to get at. As mentioned previously, I'm not taking much with me in the way of spares. The bike touring tool kit is minimal as well. I keep the tool kit in the rack pack for easy access. Yes, I know I said I wasn't taking cooking gear on this bike tour, but I still have a few items I can classify under my ‘kitchen' section! One of these, is a water filter which I'm pretty keen to check out to see how practical it is. The amount of food I carry will vary from day to day. The following items neatly pack into one small bag. I don't need to take much with me in the way of shampoo – one of the benefits of being bald when you travel! This is a mix of cycling and non-cycling clothes. In fact, there's not much difference between the two! I prefer to have items of bike touring gear that have dual purposes, and this especially applies to clothes. For example, I am taking a spare pair of trainers/sneakers, but these can also be used to cycle in. I am taking a spare pair of Hummvee cycling shorts as my ‘evening wear', which can also be used to cycle in. This list also includes items that I will be wearing. One of the things that I have to include on my bike touring gear list, is a laptop. Or a Chromebook to be more precise. This is because I will need to do some work on the road as I am cycling in Greece. The other electronic gadgets such as the phone and GPS will help with navigation. A few odds and ends that end up in the handlebar bag. In this video, I go through my cycle touring kit item by item, showing you why I chose it, and where I pack it on the bike.